This article was contributed to Stand Tall For Christ by my friend and fellow Christian Blogger Victor Uyanwanne. Please be sure to visit his blog and follow him if you find his writings inspiring and practical as I do. This is the picture of the effect of secularism and similar philosophies not only in America but in many places around the world. A society governed by these three ways of thinking can never have a strong moral fabric that can make it withstand the test of time. You feel that no one should tell you how to live your life. You do what you think is right only in your own eyes. You are your own standard. And you think no one else – not even God – should ‘interfer’ in the running of your life. You don’t even care that what you consider right may not be right in God’s eyes. Replacing the principles of God’s truth in your life with the human philosophy of individualism will not take you closer to God. In the final analysis, living by the philosophy of individualism will not turn out well because, you cannot continuously be doing only what you like without hurting the people around you – friends and families alike, without running foul of the laws of the land, and most importantly without displeasing God. As a result, you focus on removing God from your daily consciousness and you persuade other people to do the same as well. Don’t you really need God? I bet you do, even if you don’t want to acknowledge Him. It is self deception to think that you don’t need God. You had better face the truth now: you are eternally lost without God. So you need Him. The more you run from God the more your need for Him. And the more you fail to acknowledge Him, the greater the need for you to acknowledge Him. This is the belief that there is no absolute truth; that truth is relative, that what’s true for one person may not be true for another person. Many people believe this lie and are running their lives with it. It is a dead end, because it does not consider the fact that God’s words are absolute truths that apply to everyone of us. Anyone who believes in God must understand that God’s truths are not relative. God’s truths are eternal and are universal. The philosophy of relativism is a weak foundation. A life built on it will collapse in your face. 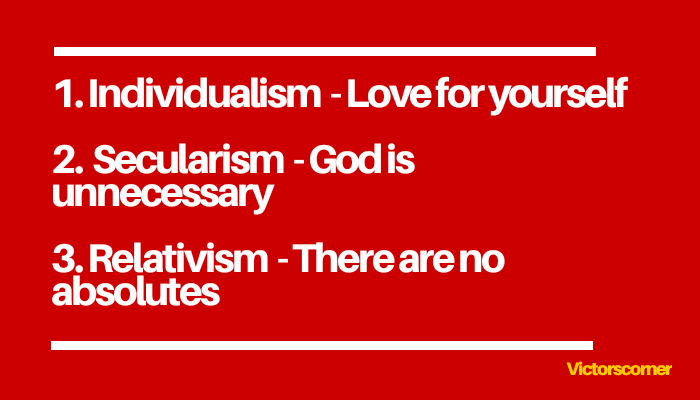 Don’t be conned by individualism (love for yourself), secularism (God is unnecessary), or relativism (there are no absolutes). The consequences as a society and for us as individuals for falling for these cons is staggering. Without a commitment to truth and a commitment to the authority of God, our culture is crumbling. Victor Uyanwanne writes from Lagos, Nigeria where he lives with his wife and two children. You can visit his blog Victors Corner for more inspiring articles by him. Thank you again Victor for your contribution. Next Next post: Does Your Church Need a Security Team?